Dr. Paul Miller is the Principal and CEO of Green Tech High Charter School, a highly successful school for boys in Albany, NY. An expert in urban education, Dr. Miller has specialized in school reform and redesign for over fifteen years, counseling school officials and administrators on effective strategies to increase student performance and establish a culture of success. 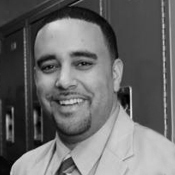 He has committed his life to educating and empowering low-income, urban youth with the hopes of facilitating change and undoing the trend of academic underachievement that often plagues inner-city, minority males. Dr. Miller’s mission is to educate as many people as possible in a variety of different ways, including his written works. Both books can be found on amazon.com and barnesandnoble.com. Academic failure is swarming the country and immersing Black males in a life time of drowning struggle. Something needs to be done! Dr. Miller has been in education for over 16 years and has developed systems that work to make sure young Black men have the ability to achieve and reach college. In his current placement, with the help of his team, they have consistently achieved graduation rates over 90%, 100% acceptance to college, and millions of dollars in scholarship money for over 97% Black males. Dr. Miller will identify several factors that currently hold Black men back from succeeding and provide strategies as to how We Can Do Better as individuals, families, communities, and as educators. Dr. Miller will teach how mindset is the key and what needs to be done to move it towards thinking like a champion. Additionally, various strategies will be shared on how to create schools that work for young black men.